Items listed here are for those pins and other collectibles that were onliy sold through the Hard Rock Online Shop which was established around 2000. This includes the onliune auctions for very limited edtion pins the site has hosted in the past. You can check out current collectibles at the link at bottom of page. To be posted here the inital sale of the item was online ONLY from the offical Hard Rock Cafe web site. Typically, no city will be shown on pin unles the item is a freamed set of pins for a particular series. 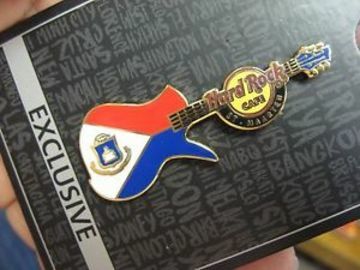 Note that if there is no city name and the pin was not sold online it belongs in the "Hard Rock Pins Without Location" section.